They are about 13 inches tall. I used Red Heart Comfort yarn with a 5mm hook. Art is the beige moose I made for my father (Art) on Father's Day this year. Muddy is my brown moose that I tested my pattern with. I absolutely adore them both and I hope you do too. (see my Dad with his moose here) And please feel free to name your moose anything you want! Art's overalls are also a free pattern here on my blog, pick up that pattern here. Use the same yarn weight and hook size that you make your moose with. The overalls were originally intended for a bunny with a big bushy tail. After you put the overalls on your moose feel free to sew up most of the gap and just leave enough room for the moose tail. 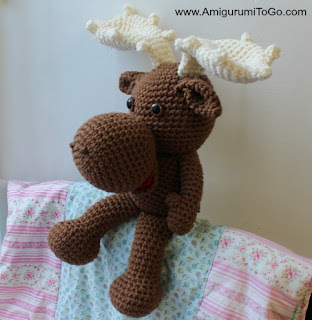 Scroll down this page for the moose pattern. There is a print friendly button at the bottom of this pattern and also the option to leave a donation. UPDATE: There is a smaller version of this moose available right here. you can use buttons, a french knot or paint eyes on. I used 10mm and 15mm safety eyes that I glued in place. *The head and body are worked in one piece. If you plan to install safety eyes they are placed in between the 11th and 12th row with 6 or 7 visible stitches between them. Add in a marker at the end of row 2 and move that marker at the end of every row. There are assembly instructions at the bottom of this page. f/o leaving a tail for closing up the gap. Weave in and out of the remaining stitches and pull tight to close. Knot off and hide yarn tails in the body. If you'd like to add thumbs as I did then insert yarn in between the 5th and 6th row, ch1 then add in 4dc. f/o and shape the thumb with the finishing yarn tail. knot off and hide yarn tails inside hand. Stuff hand firmly and stuff arm lightly. *stuff leg at the end of row 22. After you complete row 22, sc until you get to the side of the leg. Fold flat, ch1 turn and sc through both sides of the leg to close up the top of the leg. ch1 turn and sc across again then f/o leaving a tail for sewing. sl st next st and f/o leaving a long tail for sewing. Stuff and shape, partially sew to head and stuff more as needed. sl st next st and f/o leaving a tail for sewing. place wrong sides of the mouth and the tongue together, sew the end of the tongue to the mouth as pictured. You can sew the mouth to the snout before or after you sew the snout to the head. I prefer after but you do what will work best for you. 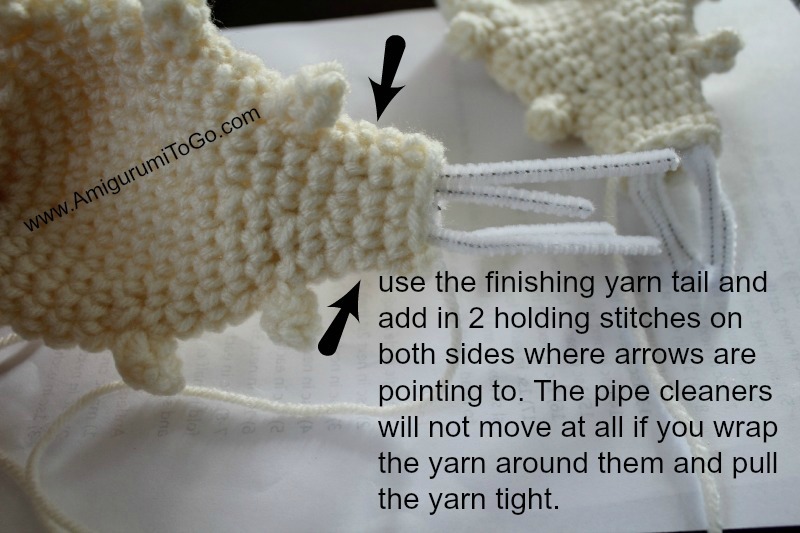 Sew the back end of mouth over and around the 13th to the 16th row of the snout and leave the front of the mouth open. I sewed the mouth off to one side a bit and not right in the center, that way you can see the mouth more. ch1, bring the corners of row 8 together and sc through both sides at the same time, going across to seal up the open edge. Then ch1, turn and sc across again. f/o leaving a tail for sewing. 2) sl st the 2nd ch from the hook, 1hdc in next 3 ch's, sl st last ch. f/o with a long enough tail you can sew into the body. For the points, flatten the antler then pull yarn through the side of the antler. ch1, put in 4hdc and f/o leaving a bit of a tail for shaping. Each point will have 2 yarn tails. Hide the starting yarn tail inside the antler. 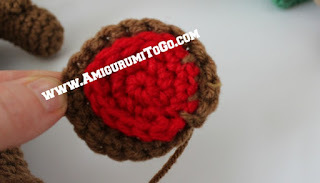 Use the finishing yarn tail to shape the point. 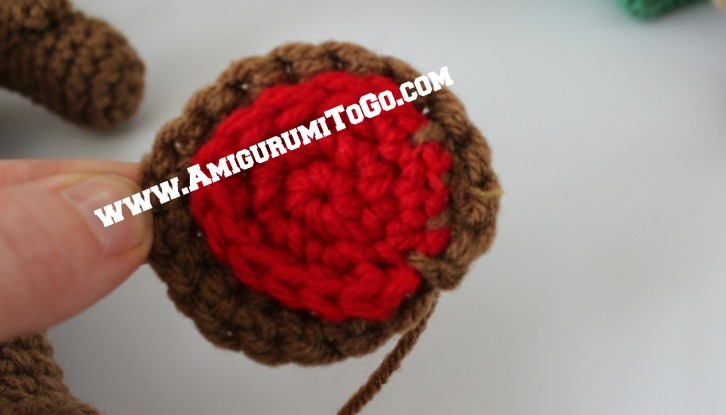 Squeeze the point so that the edges touch then put in 2 holding whip stitches, f/o and hide the yarn tail inside the antler. Hiding the yarn tails just means pull them inside with your yarn needle and cut off the end. For the antler to stand up off the head you need to add in either a wire or some pipe cleaners. Wire would probably make this a bit easier but I had none on hand when I made the moose so instead I used 4 pipe cleaners per antler. This seems to work very well for me. Lay 2 pipe cleaners side by side and bend them in the middle just enough so that you can push them through the opening. Push them in just a little then using the back end of a pencil or stick push them all the way in so that the bend reaches the other end of the antler. Using the stick push the pipe cleaners to each side so that they outline the inside of the antler just like they are in the first picture below but on the inside. When you're done cut off any excess that is sticking out. Add in a couple holding stitches to keep the sides of the pipe cleaners in place. Take 2 more pipe cleaners and again bend them in the middle just enough so that they fit through the opening, push them about half way inside leaving the ends sticking out. Cut the ends even with about 2 inches sticking out, twist each pair of ends. These will be pushed into the head when you're ready to sew the antlers in place. Again, add in a couple holding stitches to keep the pipe cleaners in place. 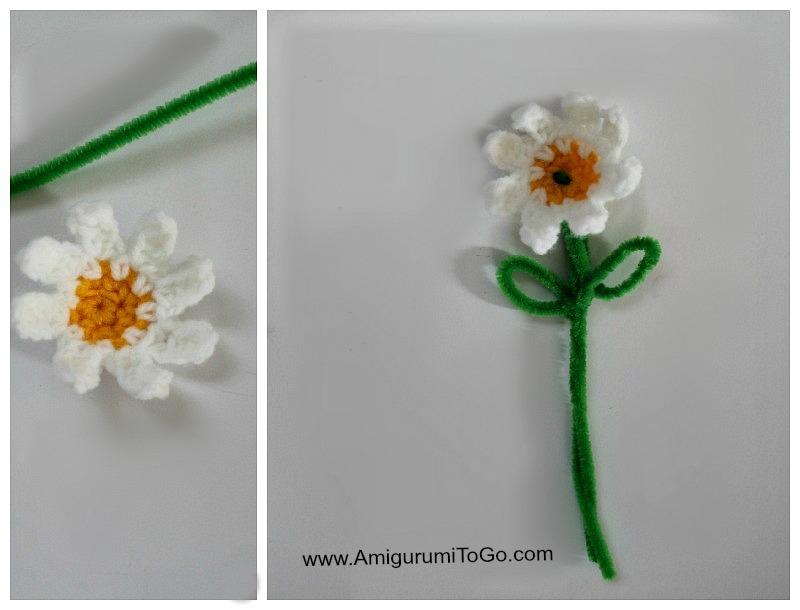 The Flower: This is just a silly flower I threw together last minute. I was not planning on including it in the pattern but someone has requested it so here we go. continuing on with the petals: *sc next st then ch4, 1hdc in each ch starting with the 2nd ch from hook*. Repeat steps between the * and the * for each petal all the way around, sl st last st. You should have 8 petals. weave in all yarn tails. Take 2 pipe cleaners, bend them in half and push them through the middle of the flower, making sure to go through 2 different stitch holes for each end. Twist 2 ends together and shape the other 2 ends into leaves. Take your time when sewing. Take breaks when you need them. Use pins to hold the parts in place and play around with the placements to be sure you are happy with how the parts look before sewing them in permanently. 1) sew on the snout. The top should be on or touching row 13 and the bottom on or touching row 19 . You can also sew the mouth piece on now if you haven't already. See instructions for sewing in the mouth and tongue section above. 2) sew the arms on the 24th row or the 2nd row below the head. 3) sew on the legs. Place the flaps of the legs close to the front of the body, overlap the 2 inner edges of the flaps. 4) sew the tail on in between the 34th and 35th row. 5) sew antlers on the 4th and 5th row. The pipe cleaners need to be wiggled into place. This part takes a bit of time but they will go in. Wire would go in much easier. Sew all around the edge of the antler and pull your stitches tight. 6) sew the ears on the 6th and 7th row. This pattern is so great! Do you crochet a slip stitch after each round and on the next round you start with a chain stitch or do you crochet in spiral? thanks for asking. Have fun! Love this!! 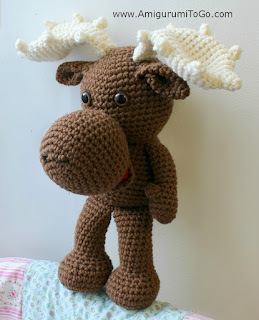 I have nearly finished making y first moose, and as mine is meant to be a child's toy, I would like to know if you have any suggestions as to what I can put inside the antlers instead of pipe cleanser or wire. My antlers look a bit "sad" with nothing in them. Thank you very much. May I can suggest Extra-heavy duty interfacing as an alternative for the inside of the antlers. It is quite thick, I use it inside the ears of rabbits when I make them, it is sturdy but soft. May need to double it. This is what I am going to use. Can you make a super cute Dragon pattern that can have add ons ? I just found you on YouTube! I love your work and your patterns. Thanks for giving us so many great patterns! no I don't have a video available yet. 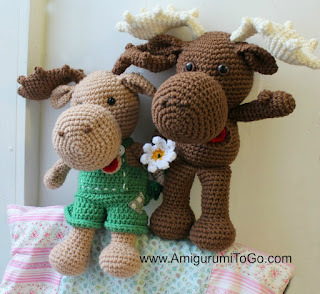 I"m not able to find the pattern for the smaller moose. Help? I just added the link to it in the description of this big moose, so scroll all the way up to where I say Meet Art and Muddy, it's in that section. OR scroll all the way up past that until you see the heading of my blog and click on Amigurumi To Go, it'll bring you to my latest post which is my little moose. Can you post the pattern for his cloth please. Thank you so much. I absolutely love your creations. 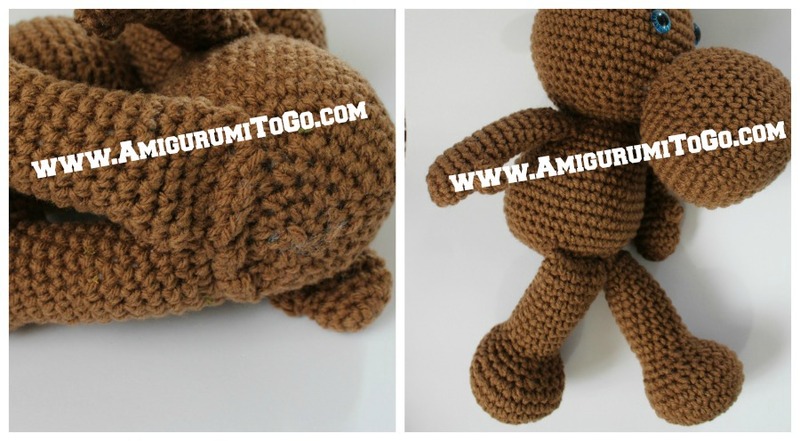 I recently crocheted the pig �� Extremely happy with the turn out. I would love to do the moose, would you happen to have a video tutorial on this? Also I would like to say you make wonderful videos and thank you soo much for sharing. Thank you SO much for offering this pattern free. My 2 grandsons are currently living in Alaska- My son-in-law- their dad is stationed there with the U.S. Air Force. My grandsons and daughter absolutely LOVE the moose up there so it was great fun being able to make some of these cute stuffed moose for the boys. remember to chain 1 after you pull the yarn through. It doesn't really matter, you can put the 4dc in the same hole or in a space right next to where you pulled through. Hope that helps! Thank you for the great pattern and for sharing it with everyone! I follow you in Youtube and I just wanted to say you are a true inspiration! Thank you! Could I suggest that you add in when to add the eyes? I am a beginner and this is my first Amigurumi and I am going to have to unstuff my head & body so I can place the eyes. Just might be helpful to those starting out. Great pattern! So cute! if you scroll up to the start of the pattern, the paragraph just above starting at the head I do say where to put the eyes. Sorry you missed that part but you scrolled right by it. This is quite a large pattern and it is very easy easy to skip over parts. Sorry you had to unstuff the head, that is frustrating. Most if not all of my patterns, will say where to put the eyes at the start or in the assembly section at the bottom. Thanks for the kind words, I'm glad you like the pattern. No, there's no video for this one, sorry! I love your designs they really inspire my coursework which I do for my art GCSE in England. Please continue with these inspiring designs! If you want the moose to be a girl. Can the girl dress from the bunny fit the moose? it should. You might try a larger hook than the pattern calls for just in case the dress comes out a bit tight. do you actually sale the moose? Not the moose pattern but the actual moose. Dear Ms. Ojala, I just wanted to thank you for your wonderful patterns. I have thoroughly enjoyed every one I've tried. I also wanted to let you know that a significant portion of the antler pattern is missing from the printable version. Again, thank you for everything. thank you so much for letting me know. Unfortunately, I don't have anything to do with how the print friendly works. It's a free service available for blogger blogs like this one but we don't have anything to do with their service. They do provide support but you would have to contact them directly. I do have copy and paste available though, right click and drag over the text, left click inside the blue highlighted area then click copy. Click paste into any program you use like word or notepad. I have a small ball turned into a smiley emoji here. It also has a video if you get stuck. Unless otherwise stated, every pattern will take less than 1 package of yarn (a package with 364 yards).